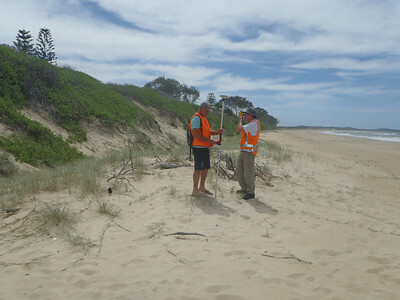 We are well into the fourth year of our beach-survey project and now have the results of fifteen surveys taken quarterly from January 2012 through to April 2016. As you can see from the Headlines below the results are really encouraging. However, we do need to bear in mind that (i) the survey data can only be indicative as its measurements are taken every 100-200 metres and (ii) four years of data is a relatively short period over which to measure. 1. Overall, Wooli beach is growing not eroding. The survey data over the past four years indicates the total volume of sand on the beach, above the Mean Sea Level, has increased from approximately 1.06 million cubic metres (cbm) to 1.27 million cbm . That is, a growth in volume of 210,000 cbm (about 20%). 2. From the Wall to the southern end of the village, the volume increased by 14, 900 cbm (12%). 3. From the southern end to the dive boat jetty, the volume decreased 6,750 cbm (5%). 4. From the jetty to the Main St – River Rd fork, the volume increased by 49,775 cbm (30%). 5. From the fork to the northern end of the village, the volume increased by 32,465 cbm (16%). 6. 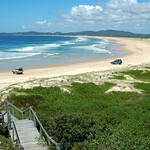 From the northern end to Wilsons Headland, the volume increased by 120, 240 cbm (28%). Thanks once again to Brian Saye and the beach survey team, not only for their ongoing efforts in accurately mapping changes in the beach but also for increasing the number of measurement segments in the survey by 25% in 2015-16. Brian noted that the percentages above relate to 0m AHD as adopted in the sand sourcing study. This effectively means the changes are relative to the Mean Sea Level. Thanks once again to Brian Saye and the beach survey team for their ongoing efforts in accurately mapping changes in the beach. A quick read of our earlier survey-stories, http://protectwooli.wpengine.com/category/research/beach-survey/ should help if you need a refresher on the whys and wherefores of our survey program. We are now well into the third year of this project and have the results of nine surveys taken each quarter from January 2012 through to June 2014. The beach has continued to build up across its entire width from the dune to the low tide line. While the improvement is slow it continues the growth shown in the 2013 surveys. The 2014 surveys confirms a substantial build-up of the beach nearer to the dune which is now at its highest level since our first survey in 2012. Nearer the water the beach is more eroded then in 2012 but has built up since the low point in 2013. 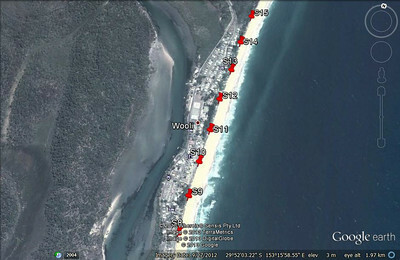 There is no consistent trend across the 13 surveyed segments covering this part of the beach. High and low measurements are spread fairly evenly across the 2012, 2013 and 2014 survey. If you want to see the details here’s a view across the whole village in which you can use the PDF-magnifier to zoom in on particular sections. 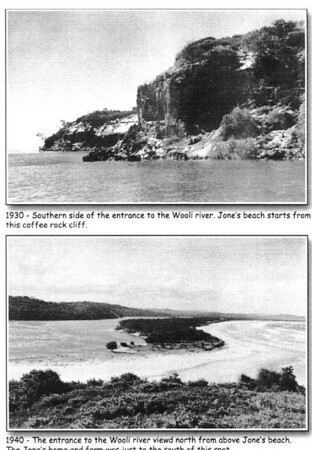 Here are the views north of the village to Wilson’s Headland and south from the village to Jones Beach. Thanks once more to Brian Saye and his team for completing another great survey job. This survey, October 2013, was bigger than usual as it not only included the awkward Jones Beach but also gives us a first accurate picture of the sand traps. – Nearer the water the large majority of sections have gained a little sand since the last survey but this area is about average across all the surveys. A big thank you to Brian Saye and the beach survey team for their ongoing efforts in accurately mapping changes in the beach. A quick read of our earlier survey-stories, Beach Surveys and Steady as she goes, should help if you need a refresher on the whys and wherefores of our survey program. We are now well into the second year of this project and have the results of six surveys taken each quarter from January 2012 through to June 2013. A recent addition to the survey has been the capture of the locations of each of the 80 sand-traps now in place so that their effects can be directly measured. Two headlines are apparent from the survey data. Firstly, the foot of the main dune in front of the village has built up substantially from June 2012 to June 2013 across all 26 survey cross sections (S12 to S38)covering that area. Here’s a view across the whole village in which you can use the magnifier to zoom in on particular sections. You can see the difference if you compare the pink line of June 2013 to the blue line of June 2012. Here’s the section in front of the bowling club to illustrate the build up. There may be multiple factors causing this build up but the correlation with DuneCare’s sand-traps is striking. Interesting to see that while the foot of the dune is building, closer to the water the beach has become steeper and lower over the year. Secondly, the surveys confirm that there is substantial variation in the pattern of change across the 7km length of the beach as highlighted in the recent Automated Cameras Report. In contrast to the change described in front of the village, the sections towards the river walls show little change (eg S6) while the sections north to Wilsons show both erosion (eg S50 near Wilsons) and accretion (eg S42 a little north of the village). Finally, an exciting new prospect we’re looking into is the possibility of using the survey data to start measuring changes in the total weight of sand on the beach. This will help determine whether the beach is systemically shrinking, growing or just oscillating a constant amount of sand along its length and breadth. – but they’ve also recently become accredited quad bike riders which has really made the process easier and faster. As Brian says “there may be an illusion (or two) in this initial data , such as not yet picking up the effects of the sand traps, but we’ll work those out over time. And Jones Beach is a bugger to get the gear to so has had only one survey. It’s a high priority after the Christmas break”. At each measurement point all four surveys are colour-coded so it’s easy to see how the beach is changing. For example, take a look at an enlarged view of S38 at the northern end of the village. While the beach hasn’t changed much near the Bowling Club at S22, its clearly grown at S52 near Wilsons. 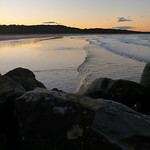 The initial conclusions from this data are that the beach around the village has been stable during 2012 with a lot of sand deposited from January to June which has since been taken away and has now shown up at Wilsons Headland (hence the title of this page “steady as she goes and a bit north”).